Our members this week were delighted to welcome our District Governor Susan Wakefield and husband PDG John Wakefield. Susan in her relaxed manner spoke of several District highlights including a positive message on membership growth and also shared stories of her unforgettable experience attending a Polio immunization day in a town named Nua just outside Dehli. PDG John outlined plans for the 2019 District Conference in Newcastle and encouraged members to take advantage of the early bird discounts. 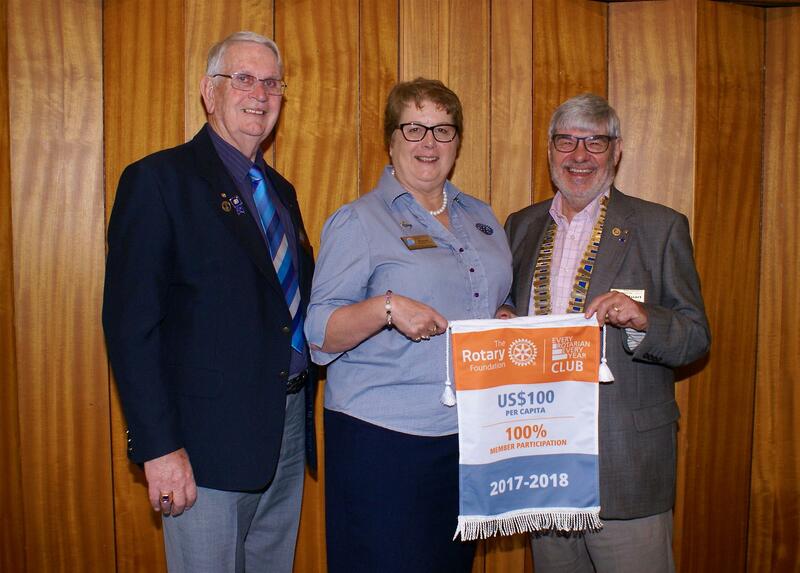 Susan also presented President Stuart with an RI banner recognition for our excellent Rotary Foundation achievements in the 2017/18 Rotary year --one of only two presented in D9685 for the 2017/18 Rotary year.